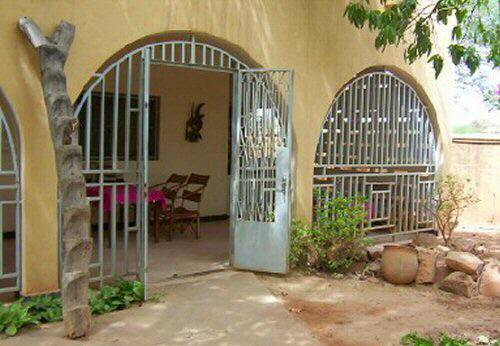 The rooms of this small hotel in Sévaré / Mopti are situated in two "mansions" next door to each other and the building of the Museum. 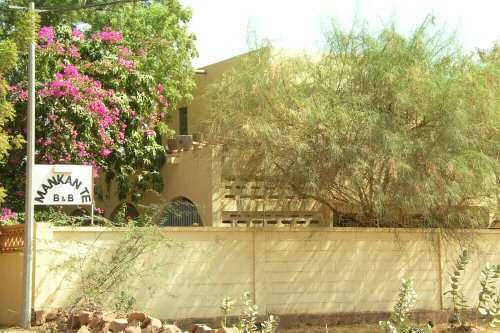 They are close to the main road in direction Bamako in the "Million-kin" quarter (quarter of millionaires). There's a sign on the road. Distance only 1km to the airport, but don't be afraid of being disturbed: There are only a few flights a week and all of them during daytime hours. There are 8 air-conditioned rooms: 6 rooms in 2 family-houses, three in each of them. Two rooms share a shower and the third one has a bathroom of its own. In the building of the Museum You find two new rooms with bathroom. All rooms are equipped with double beds, in some rooms we have the possibility to put in a second bed. Rooms are reasonably equipped and have typical decoration, air-conditioners, fans, windows with mosquito-protection; the possibility to affix your mosquito net; halogen bedside lamp, desk and plugs. Of course everything is very clean and in good condition, even hot showers are provided! There are some restaurants nearby. We recommend the MANKAN TE Restaurant (300 m away). Small food shops, fruit in the market (600m) and everywhere along the roadside fruits in season, cucumbers almost all year, baguettes, grilled meat..
and for special purposes wine or champagne. After a long journey by bus or car a cold beer or an icy Coke in MANKAN TE B&B will be delicious!! !